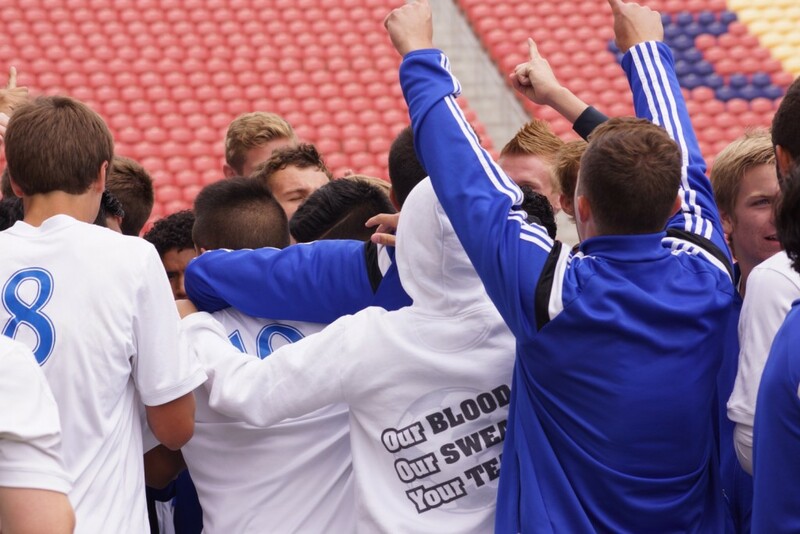 SANDY— The Dixie Flyers are the kings of the 3A soccer world. 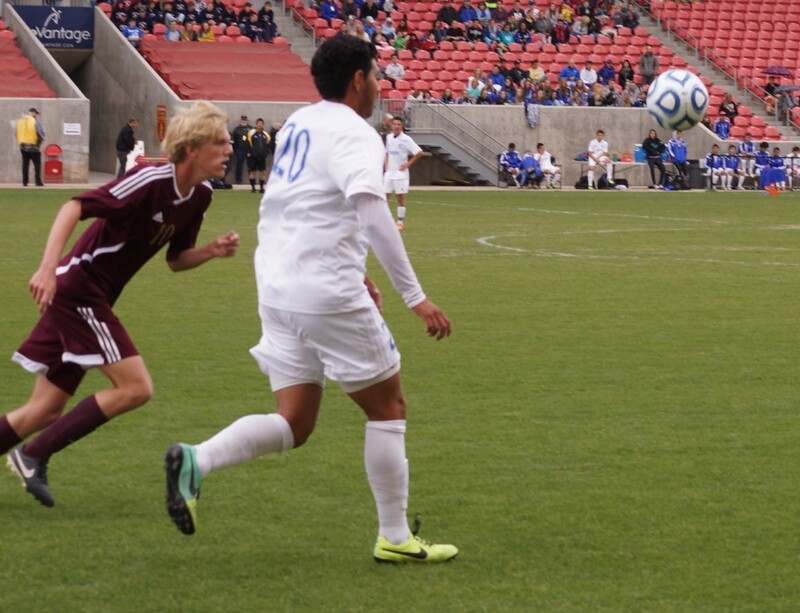 Saturday, Dixie’s boys team matched this year’s girls team by winning the 3A State Championship. 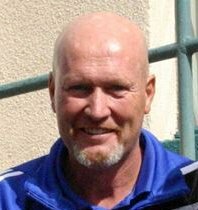 Both teams are coached by eternal optimist Burt Myers, giving the coach and the school a rare double title. 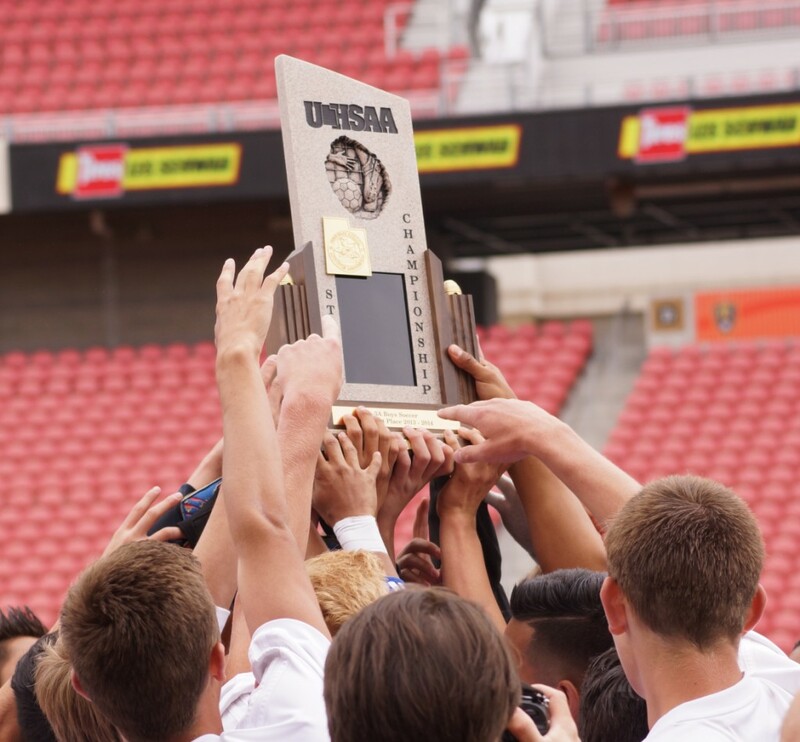 The boys team built a 3-0 lead over region rival Cedar High and held on to win its second 3A State Championship in three years, 3-1, Saturday at Rio Tinto Stadium. 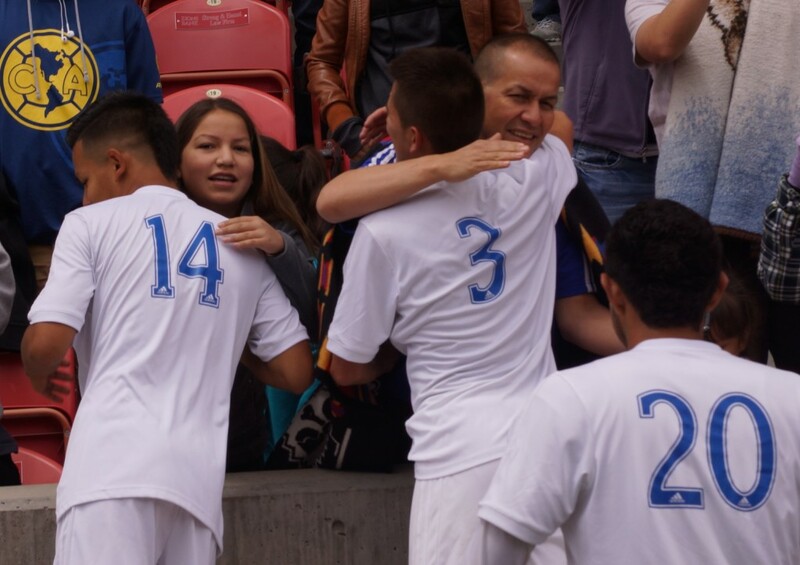 Dixie wasted no time in attacking the goal and struck home first in the ninth minute when sophomore Tyler Bennett took advantage of a great pass from Cesar Perez, then outran a defender and took on the Cedar goalkeeper one-on-one. 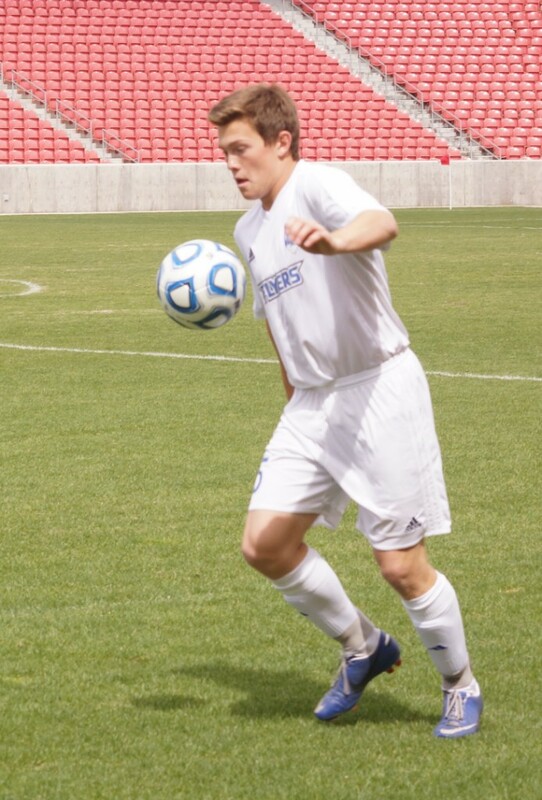 Bennett tucked it in the corner past the goalie and Dixie never looked back. Bennett, who scored his sixth goal of the year, was ecstatic to make such an important play on such a big stage as just a sophomore. 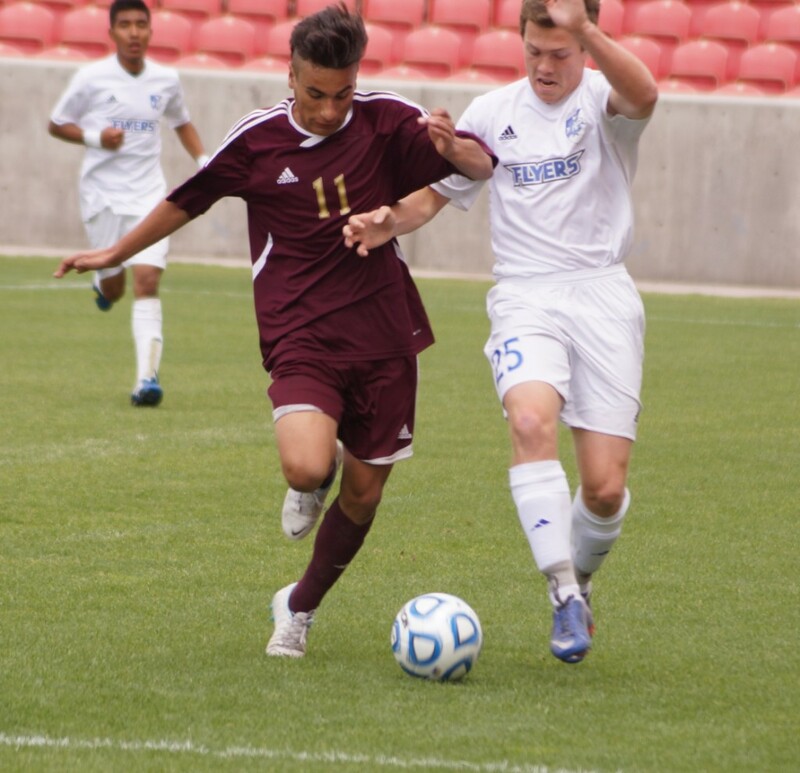 Myers noted that his sophomore benefited from experience learned from the semifinal match Friday with Juan Diego. The next 20 minutes of game play were a stalemate before Luis Rabago broke the silence and scored off of a cross from teammate McLane Keenan in the second half. Dixie worked the ball down the middle, finding Keenan on the wing. 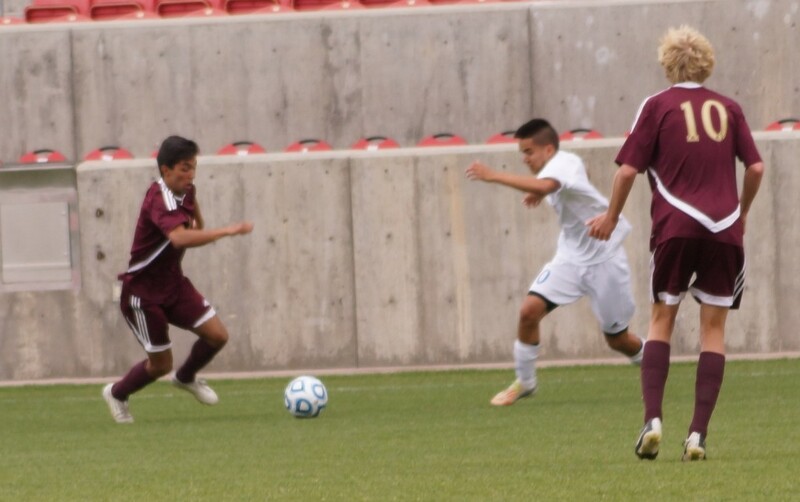 Keenan was able to cross the ball in front of the goal and found Rabago in prime position to shoot. Rabago volleyed it past the keeper and gave the Flyers a commanding 3-0 lead with 27 minutes of regulation left. 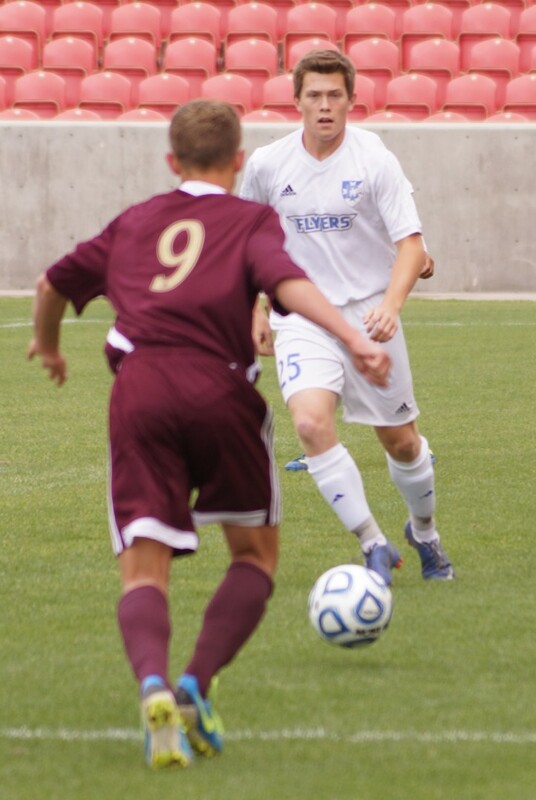 Cedar fought to stay in the game and with 15 minutes to go, slipped a goal past Dixie’s defense. 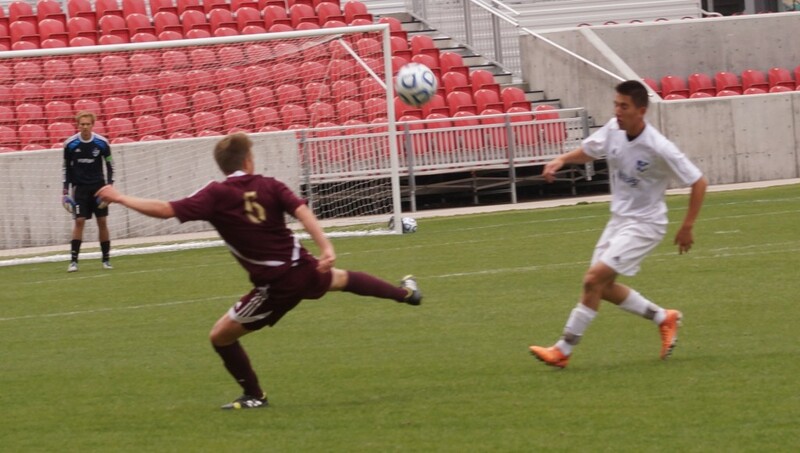 Cedar’s Christopher Hall rebounded a Cedar shot on goal that just slipped out of goalkeeper Hayden Matthews’ hands. 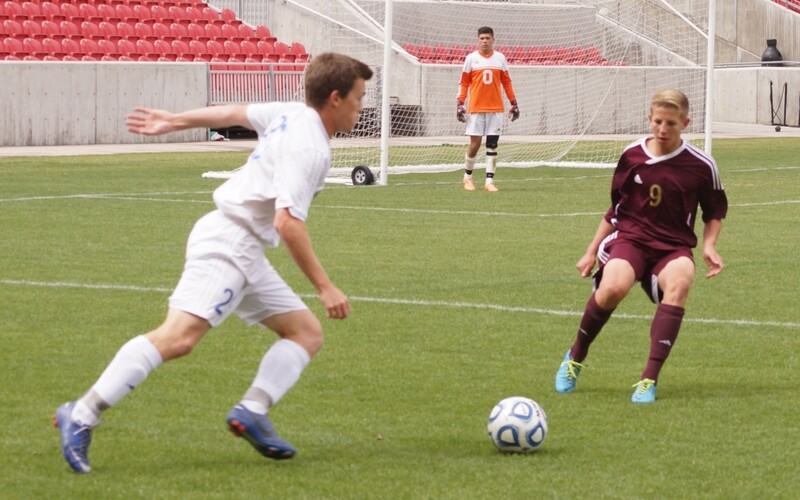 Hall skirted past the keeper and tapped the ball home to cut Cedar’s deficit down to 3-1. The Redmen desperately tried to score in the closing minutes, but each time was denied by the Flyer defense and goalkeeper Matthews. As soon as the final horn sounded, it was celebration time for the Flyers. 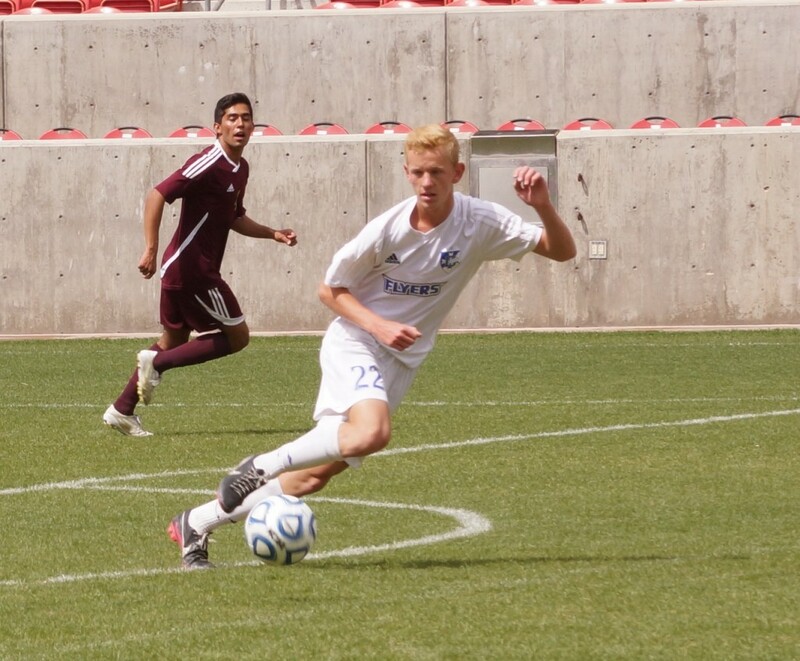 Matthews, a senior keeper and team captain who had a shutout Friday against Juan Diego, only allowed three goals in the Flyers final six games. He was the first to accept the state championship trophy for the Flyers and carried it over to his team to celebrate. 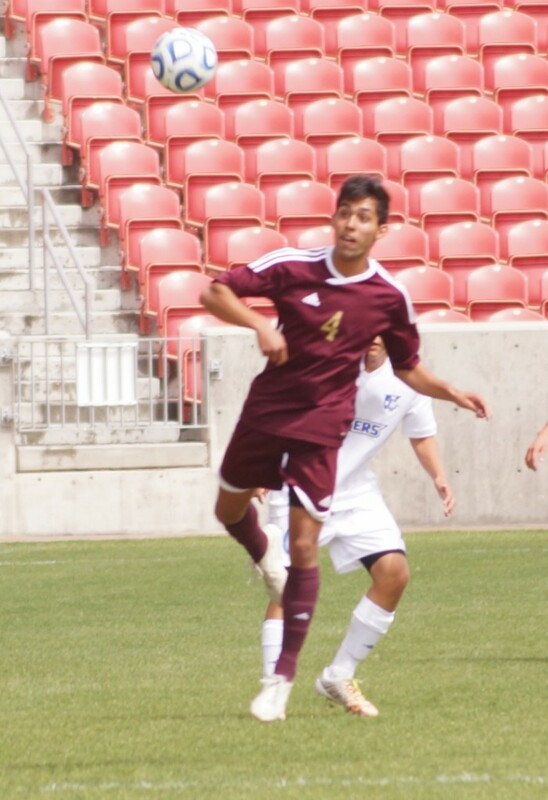 Fellow senior Perez said it really meant a lot for his senior teammates to win state their final year together. 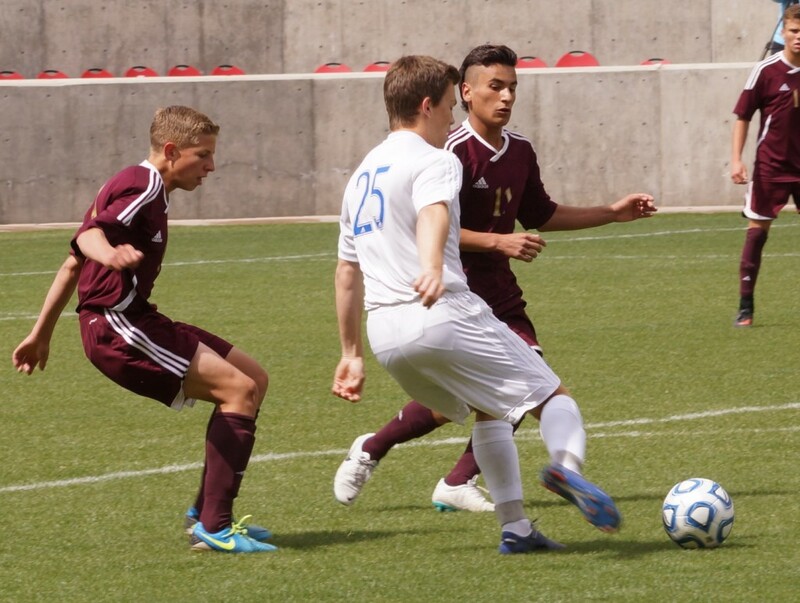 The Dixie Flyers are 3A state champions and finish their 2014 campaign 15-3-2.